As she hinted at her Edmonton rally Sunday, Premier Rachel Notley announced yesterday in Calgary that if her NDP government is re-elected it will move to help families with children by introducing 13,000 more $25-a-day child care spaces across Alberta. Making safe, quality, affordable child care what Premier Notley called "the medicare of the 21st Century" would cost $1.5 billion over five years to implement, but would pump almost $6 billion into the Alberta economy. And since the sky-high cost of child care in Alberta has a disproportionate impact on women, child-care fees capped at $25 per day per child would help more women enter the workforce, narrow the wage gap between men and women, and reduce the "motherhood penalty" in wages earned. Naturally, it would have been a challenge for the United Conservative Party led by Jason Kenney to argue we can't afford that investment when his party's platform calls for huge tax breaks for profitable foreign companies and local billionaires. So Kenney needed to distract from a positive NDP policy that was bound to get favourable reviews from a lot of voters, especially women, and also draw attention away from the bozo eruptions some of his candidates have been suffering lately without looking like what he really wants to do is to roll Alberta back to the 1950s. But I'm not sure the idea he hit upon -- announcing at his own news conference at a private religious school in Calgary that he will roll back the rights of LGBTQ students introduced by the NDP and re-litigate the whole gay-straight alliance controversy in the guise of an education policy -- is the right one if his goal is to look like a leader for the 21st century. On the other hand, if he wants to please his party's extreme social conservative base, the plan to proclaim an old piece of Tory legislation moldering on the books without having been proclaimed into law is probably a good way to do it. This may be kind of sneaky, as we've come to expect from the Kamikaze campaigner, but it would allow him to repeal the NDP's strong GSA protections without appearing to kill the whole idea. This may not go far enough for all of the UCP base, some of which longs for something more ancient than merely the mid-20th century. Consider Jeremy Wong, Kenney's latest handpicked candidate in the Calgary-Mountain View riding. Rev. Wong, an anti-choice pastor, preached in his Mother's Day sermon that women should "submit to their husbands," and suggested "guys are more cerebral" than women. Well, that's better, I guess, than Kenney's original handpicked Calgary-Mountain View candidate, Caylan Ford, who was caught commenting online that she is "saddened by the replacement of white people in their homelands," but I digress. In addition to rolling back school protections for LGBTQ students and replacing them with insincere platitudes about safe and inclusive schools "while respecting the basic religious freedom of faith-based independent schools," Kenney's plan would make privatization and other attacks on public schools easier, encourage religious schools that teach God-only-knows-what alternatives to science and facts, and blow up the ongoing curriculum review that began under the Progressive Conservative government. 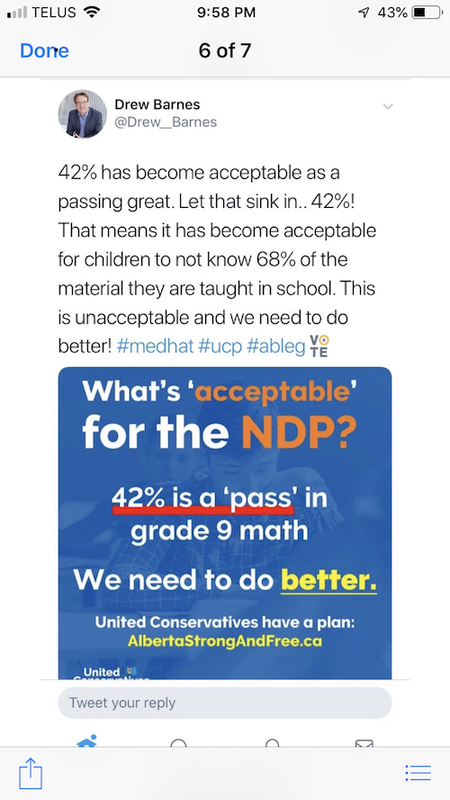 Speaking of which, Kenney claimed at his newser that there's been "a devastating reduction in math proficiency" among Alberta children. Barnes, 57, and the UCP's finance critic, is a presumably a beneficiary of the old-style math education once taught in Western Canada, which may explain why he gave 110 per cent for his leader on this issue. Getting back to the premier's announcement, Notley's government piloted the $25-a-day kid care program two years ago, then expanded it to 122 centres with 7,300 spaces across the province. Needless to say, given the cost of child care in Alberta, spaces fill up quickly. Right now, Alberta has the largest workforce participation gender gap in Canada. As happened in Quebec when it introduced similar policies in the 1990s, affordable day care will reduce that differential. As we have observed with Pastor Wong, that's not necessarily the way all UCP candidates see it, and that's apparently OK with their leader.